Make your friend the centerâ€¦of attention. The simplest thing to do, and if your photos fall prey to Centered Head Syndrome it will improve them by 1000%, is to think to yourself, “head to toe.” While looking through the viewfinder, can you see your friend’s head and toes? Good. Start there. “But the landscape is so pretty, I don’t want to leave it out!” Great, work with it. There are plenty of instances where you’ll want to get creative and start cropping your friend’s body for artistic purposes, and there are diagrams online which tidily map out where to crop, or not crop, for the best image. You can delve into the “Rule of Thirds” to think about better composition overall, no matter what the subject of your photo. But before you go there, I want you to have 10 photos under your belt where you can see your friend, or friends, from head to toe. Master this one thing, and then expand on what you’ve learned. Your friends will thank you for it. With many thanks to the U.S. Gov’t/Peace Corps for providing a copyright restriction-free photo of a beach in Togo. It’s so restriction-free that I don’t need to credit anyone or anything, but I will, because I can. My hair has never not been unruly. When I was wee, I had a (hand-me-down) red Murray tricycle. When my knees started hitting the handlebars, I graduated to a (hand-me-down) violet Schwinn Hollywood with coaster brakes. I loved that bike. I loved everything about that bike. Every spring I would sit in the driveway with a bottle of chrome polish and a shop rag, and my tiny fingers would lovingly polish the fenders, the wheels, the spokes. And eventually it, too, was too small. When I was in 6th or 7th grade, I got my very first New Bike. 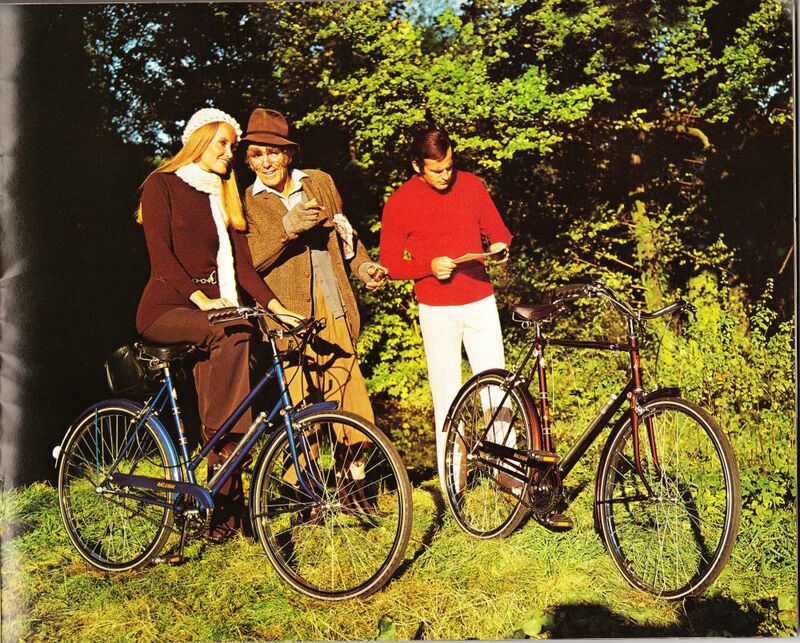 Again a Schwinn, my silver Sprint had a full 10 speeds. This was moving up in the world! It wasâ€¦okay. A perfectly serviceable bike, and I rode many miles on it. It didn’t have the pizazz and style of the Hollywood, but having gears was a bonus. I eventually outgrew the Sprint and on the very rare occasion that called for a teenager on a bike, I’d borrow my sister’s semi-abandoned Schwinn Collegiate. At that point in time, the only adults who rode bikes did it for sport and I was no athlete. Fast forward a number of years, and mountain biking has taken off. At the time that I move to Colorado, my dad and his wife bequeath to me one of their two Giant Iguanas, with the statement that “I think it’s the law that you have to have one of these if you live in Boulder, right?” I am blissed. But I am still no athlete. I ride it to and from the supermarket on occasion, and that’s it. After throwing myself off the bike twice (and with great flourish), and feeling the pain of a beyond-empty wallet, I sell the Iguana for a piddling amount of cold, hard cash and pay a phone bill with it. A few years later, my then-boyfriend secretly joins forces with my dad to buy me a new bike for Christmas. I am the very happy owner of a silver 1999 Trek 800, which still has the knobby tires for gripping the dirt but a somewhat more upright position which is better for my weak shoulders. We take it out on a couple of (flat) trails, and I ride it around the neighborhood in the evenings from time to time. I still have that bike, and it’s still in great shape, mostly because I so rarely ride it. It’s just too technical for me. No, what I really want is something more reminiscent of my old Hollywood, but with a few gears. I don’t need a lot, just, say, 3. But it has to have fenders. And a basket on the front, to hold a grocery bag. So I start window shopping.Â Used bikes on Craigslist cost just as much (and more) than some new bikes, plus carry the desperate need for a tune-up, so I stick with new models. Cruisers have the right look, but they’re heavy and clunky and single speed. Dutch-style bikes (think Electra Amsterdam) have the look and sometimes the gears, but the price tag is prohibitive. PashleysÂ are gorgeous all around, but there’s that dastardly price tag again. So I look. And I look. And I look. Last Wednesday, on a whim, I search Craigslist again. I’d long ago learned to leave out the word “cruiser,” as that only brings up ads for crappy old bikes that people are asking astronomical amounts for (and I don’t really want a cruiser anyway). But for some reason, “cruiser” is what I type in. And there are the expected ads for $200 rust buckets that will require another $200-300 of work just to get running. At the bottom of the page is the header “Few LOCAL results found. Here are some from NEARBY areas…” and there, there is The Ad. 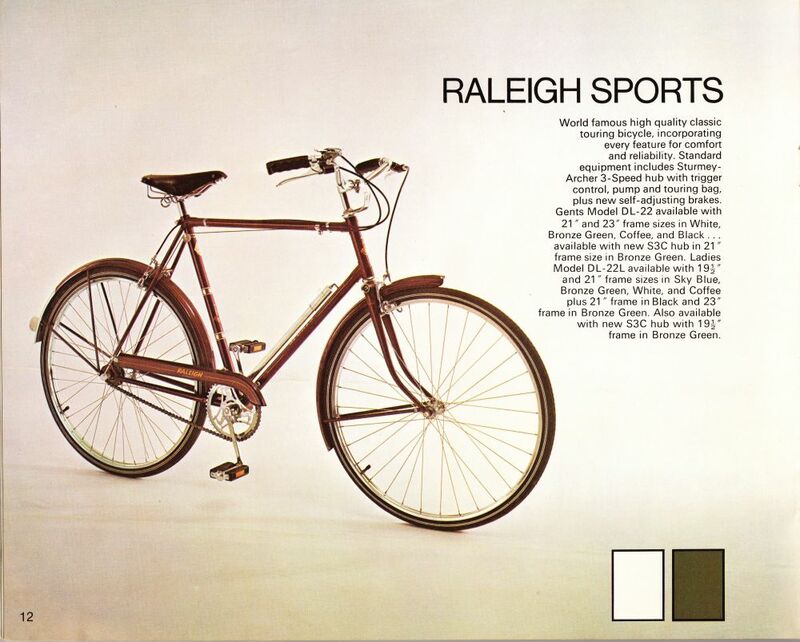 The headline reads Vintage Raleigh Sport Bike Cruiser – $50. I click the ad. I see the photo (of a road bike, not a cruiser). I fall in love. I call the number in the ad, and get voicemail. I wait. I wait. I wait. I wonder if I’d misspoken my callback number. I wait. The next morning, I call again. Live person this time! I ask a few questions. I get the answers I’m hoping for. 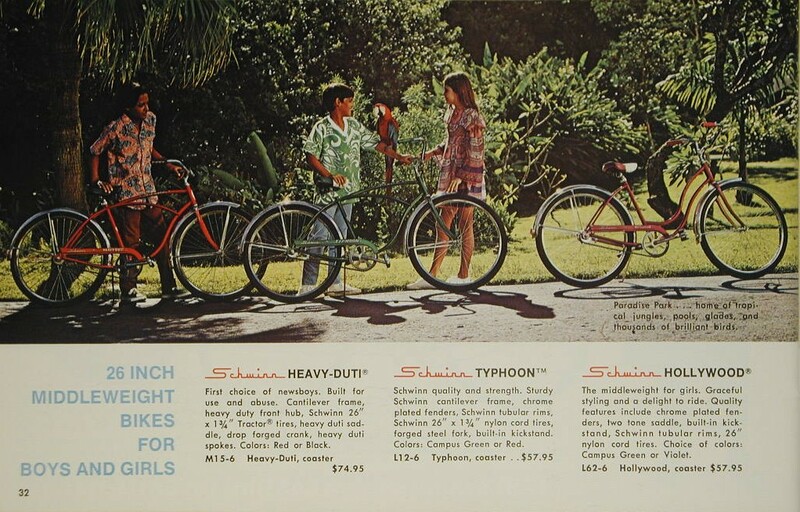 I make arrangements, and that Friday, I pick up My New Bike, a 1972 Raleigh Sports ladies (step-through) model in Coffee. Functional 3-speed Sturmey-Archer hub. Made in merry olde England. Rideable, but this will someday be a “before” photo. It’s missing its original Brooks saddle, frame pump and “touring bag.” It rattles. It’s dented, it’s scratched, it’s greasy and dusty and has a few bird feathers stuck to it. It’s beautiful. I’ll be getting new tires first thing, and then will start adding/replacing parts as need determines and budget allows. Stay tuned! Broken glass? No, gelatin cube! What my family lovingly calls Jellofetti Cake is in truth a reworking of an official Jell-OÂ® recipe called Crown Jewel Dessert, previously known as Broken Window Glass Cakeâ€”because that’s appetizing, no?â€”when it was introduced in 1955. This is another was-going-to-be-a-tutorial post, but honestly, if you hit a stumbling block while making packaged gelatin, my photos aren’t going to help you. Shown here: A scan of the recipe as printed in The Joys of Jell-OÂ (1962), with bonus recipe for Ginger Fruit Mold because I didn’t feel like editing it out. Click for embiggerating so you can actually read the recipe(s). Do you remember back in the first paragraph when I said my family (and by “my family” I mean “Grandma Wink”) reworked this? My grandmother’s interpretation is what we’d now call a “mashup” of the Dessert (crumb crust) and Pie (ladyfinger) versions. So here’s what you do: line a springform pan with split ladyfingers (sides and bottom; you’ll need two packages). No crumb crust necessary, no cutting ladyfingers to fit within the confines of a too-short pie pan. I never got my grandmother’s own personal version of this recipe (she is notoriously bad at sharing her recipes, which is a shame because she was an excellent cook and we didn’t press the issue before her mind started to wander, now so very much is locked away inside her head and even she can’t reach it) but I am confident that she did not use Dream WhipÂ® or Cool WhipÂ® or any other “whipped topping” that was not simply whipped heavy cream.Â My example here looks a little “short” because I’ve been dipping into my cream to lighten my coffee. Note to self: buy milk. Anyway, just whip up a pint of cream. I don’t even bother to add sugar. Another place where I don’t add sugar: to the gelatin used for the fluffy filling part. I mean, really. Is Jell-O not sweet enough for you? That step in the recipe makes me wonder if lemon flavored Jell-O wasn’t always pre-sweetened, which would make it a considerably less bizarre accompaniment to all of those tuna-in-lemon-gelatin salads. This recipe is going to take you about 9 hours from start to finish, but 8 of that is just waiting for the various batches of gelatin to gel. Prepare the first three the night before, then finish the rest in the morning. You’ll still need a few hours of chilling time after the last step, so plan way ahead. I typically only use about Â½Â to â…” of each flavor of the gelatin cubes, and impatient kids can snack on those while they wait. My grandmother always served this to finish out our family’s Easter dinner, but I’ll make it just about any time someone asks nicely. It’s great in the summer when you don’t want to turn on the oven, but it will go limp if left at room temperature for a few hours. Considerably faster if you’re attempting to serve it outside on a hot day. I just realized that you could probably make an adults-only version using vodka instead of cold water wherever it’s called for, but take away people’s keys. I’ve never met anyone who could eat only one slice. This could lead to serious trouble. For those of you not “in the know,” I collect old cookbooks. I frequently read them cover to cover, like a novel. Sometimes, I even cook something out of them. I’m particularly attracted to recipes that use tomatoes in unexpected, perhaps ill-advised ways, as evidenced by the now-classic Ketchup In Dessert experiment. So when my mom bought me a copy of something called Royal Cook Book from 1937 (brought to us by Royal Baking Powder), and then found a recipe inside for Love Apple Cake, well, it was just a matter of how soon I could get into the kitchen! …wherein any additional information in the newspaper version is shown in brackets.